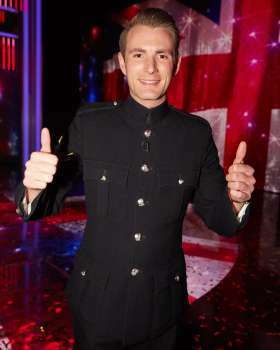 Magician, illisionist and army bandsman, Lance Corporal Richard Jones of the Household Cavalry won the tenth series of Britain's Got Talent 2016. Amazing the nation with his magic, and winning with a heart-felt performance, that touched all of those tuning in. The show pulled a peak-time audience of 10.5m and a 48% share of TV viewers at around 9.55pm, compared to the average 8.5m and 42.4% share during the two-and-a-half hour broadcast. Lance Corporal Richard Jones joined senior members of the Royal Family, at the Royal Variety Performance 2016, for a spectacular performance to mark his victory on winning Britain’s Got Talent in 2016 with a standing ovation at London's Hammersmith Apollo. In summer of 2016, Richard headlined the West End cast of Impossible at the Noël Coward Theatre for a 6 week run. 2017 has continued to be a successful year for Richard. Launching two magic box sets into Toys R Us, a primetime ITV Special, 'Operation Magic', pulling in a peak audience of 1.8million viewers on Easter weekend, and a sell-out tour around the UK. Richard will be returning to our screens during the Britain's Got Talent semi-finals as a special guest. He is proof, dreams do come true.